Between 6 to 12 months prior to your proposed wedding date. Meet with your parish priest or deacon, even if they will not be the ones celebrating your wedding. All paperwork will be done at your home parish, and then your file will be sent to your wedding parish, if applicable. An assessment is made at this time of your readiness for sacramental marriage, and necessary documents are gathered. This is usually the Foccus Inventory, and is done at the parish with follow-up sessions, or the Prepare and Enrich Program which can also be done at the parish level. You need a copy less than six months old, obtainable from the parish where you were baptized. Send a stamped, self-addressed envelope to the parish where you were baptized with your full name, date of birth and parents’ names. (By “baptized” the Church means baptized in any Christian tradition that baptizes in the Trinitarian formula: in the name of the Father and the Son and the Holy Spirit, and with water). If you are not sure what pertains to you, please check this link. 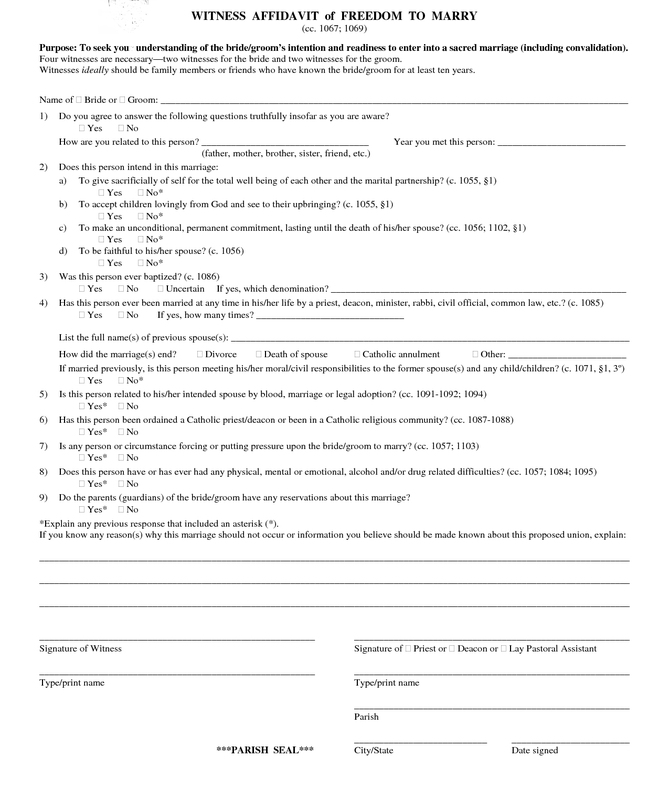 Any of these forms will take time to get approved, so please make sure that you address the issues with your pastor during your first meeting. Presuming you are deemed ready to go forward, you may begin the liturgical wedding plans. You will also be informed of the parish guidelines and of any costs or offerings involved. In the event that the priest or the deacon believes that you are not ready to go forward, he will give you reasons for his recommendation that you delay your marriage. If you disagree with his decision, he may refer you to another priest or deacon; or you may appeal this decision. The priest or deacon will explain the appeals process at this time. If the marriage is temporarily delayed, you may appeal to the Bishop through his representative, the Episcopal Vicar, in any given region.